IT Support Analyst job role is involved with day-to-day monitoring of workstations, network equipment, connectivity and supportive IT infrastructure. It is a position where you are required to possess skills like troubleshooting, problem-solving, quick decision making, flexibility, and proactive behavior. The job can give you a successful career as a Product Support Specialist with an exciting pay scale. 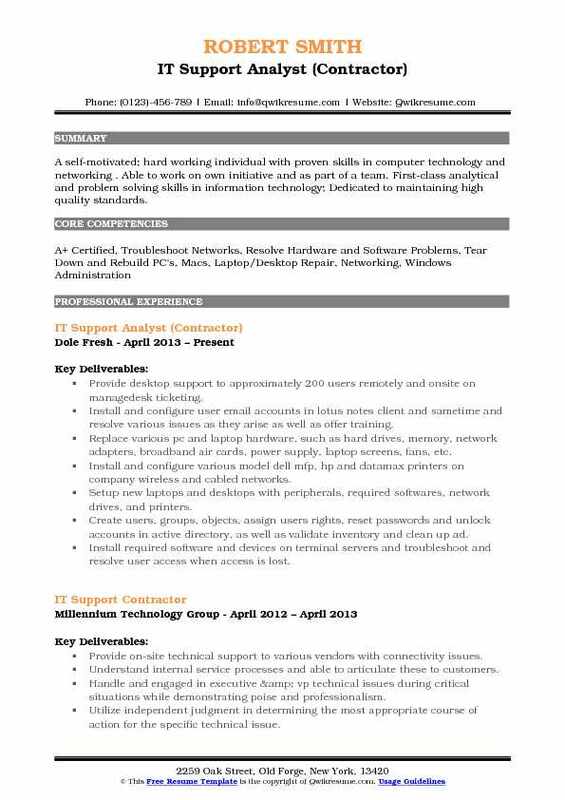 The best sample resume for IT Support Analyst should talk about your technical qualification and relevant experience in troubleshooting as well as customer support. 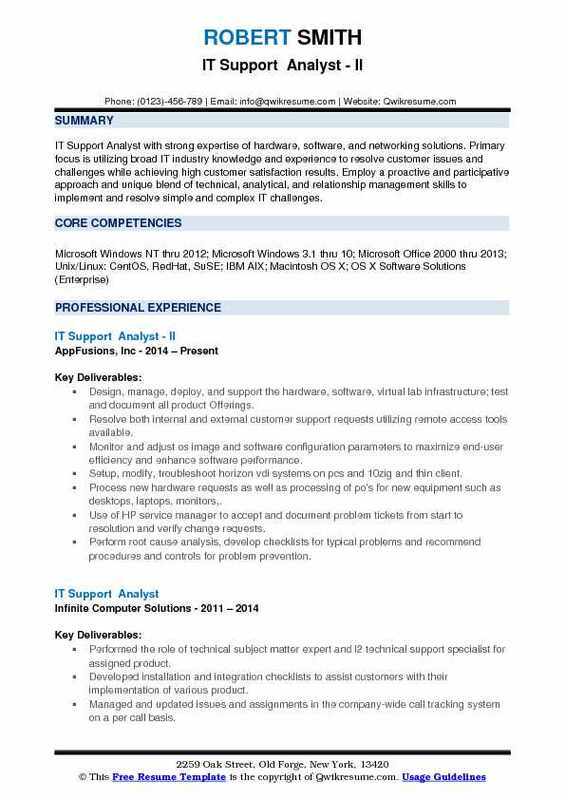 You can follow our IT Support Analyst Sample Resume while drafting yours to make it convincing to the employer. IT Support Analysts work closely with the vendors and therefore, they are expected to have good client skills. They suggest improvement in the existing technical process and frequently update themselves with the new skills to support new technology. 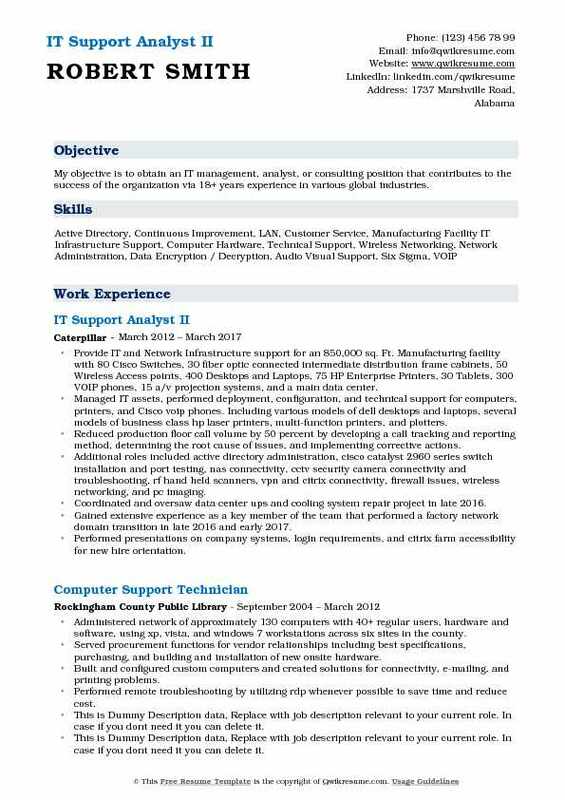 Summary : Information technology professional with over 10 years experience supporting manufacturing, healthcare and legal industries. Expertise in a service desk environment providing both hardware and software support. Skilled at building relationships with customers. General administration of active directory and microsoft exchange create, edit and maintain user accounts, mailboxes, mail contacts, distribution groups, organizational units, and access permissions. Diagnose, troubleshoot and resolve desktop, hardware and software related issues (pcs, laptops, monitors, printers, peripherals, headsets, avaya phones, side cards, mobile devices, vpn and software applications). Led the win 7 migration project from the ny helpdesk team as part of the effort in migrating 600+ users firm-wide from win xp to win 7; directed and instructed two consultants during the migration process. Set up global and local video conferencing, webex and audio dial-ins for end-users and clients. Assemble projector/screen for manual implementations of audio/visual support for meetings/conference calls. Image, re-image, build and configure new/used company laptops and desktops. Assign and configure avaya phones/extensions and amend bridge appearances on avaya side cards via site administration. 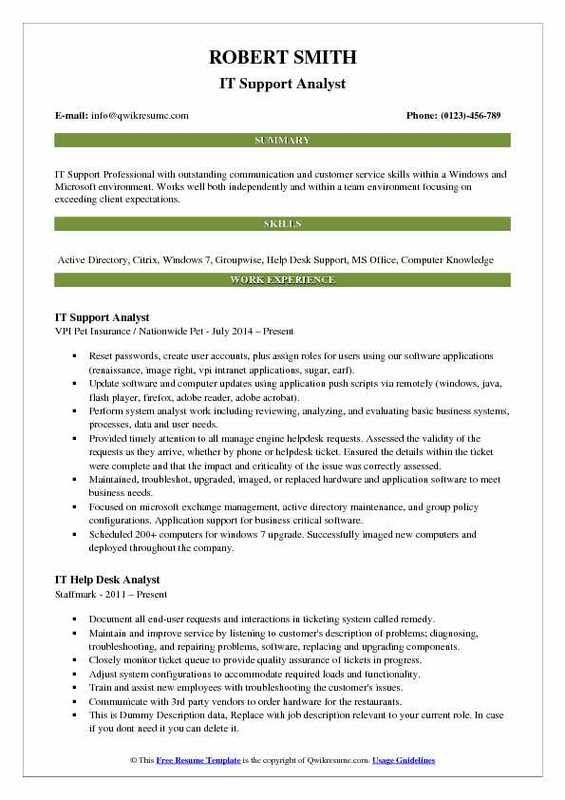 Summary : IT Support Analyst with strong expertise of hardware, software, and networking solutions. Primary focus is utilizing broad IT industry knowledge and experience to resolve customer issues and challenges while achieving high customer satisfaction results. Employ a proactive and participative approach and unique blend of technical, analytical, and relationship management skills to implement and resolve simple and complex IT challenges. Design, manage, deploy, and support the hardware, software, virtual lab infrastructure; test and document all product Offerings. Resolve both internal and external customer support requests utilizing remote access tools available. Monitor and adjust os image and software configuration parameters to maximize end-user efficiency and enhance software performance. Setup, modify, troubleshoot horizon vdi systems on pcs and 10zig and thin client. Process new hardware requests as well as processing of po's for new equipment such as desktops, laptops, monitors,. Use of HP service manager to accept and document problem tickets from start to resolution and verify change requests. Perform root cause analysis, develop checklists for typical problems and recommend procedures and controls for problem prevention. Summary : IT Support Professional with outstanding communication and customer service skills within a Windows and Microsoft environment. Works well both independently and within a team environment focusing on exceeding client expectations. Reset passwords, create user accounts, plus assign roles for users using our software applications (renaissance, image right, vpi intranet applications, sugar, earf). Update software and computer updates using application push scripts via remotely (windows, java, flash player, firefox, adobe reader, adobe acrobat). Perform system analyst work including reviewing, analyzing, and evaluating basic business systems, processes, data and user needs. Provided timely attention to all manage engine helpdesk requests. Assessed the validity of the requests as they arrive, whether by phone or helpdesk ticket. Ensured the details within the ticket were complete and that the impact and criticality of the issue was correctly assessed. Maintained, troubleshot, upgraded, imaged, or replaced hardware and application software to meet business needs. Focused on microsoft exchange management, active directory maintenance, and group policy configurations. Application support for business critical software. Scheduled 200+ computers for windows 7 upgrade. Successfully imaged new computers and deployed throughout the company. 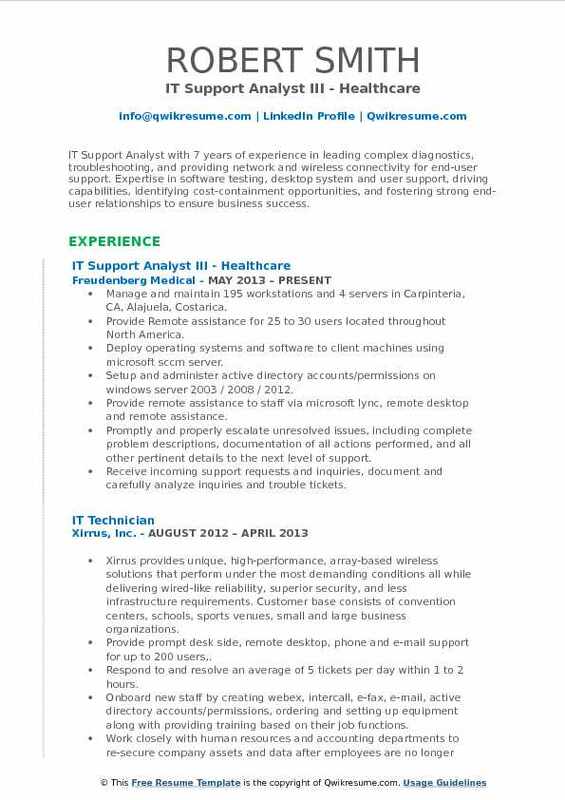 Headline : IT Support Analyst with 7 years of experience in leading complex diagnostics, troubleshooting, and providing network and wireless connectivity for end-user support. Expertise in software testing, desktop system and user support, driving capabilities, identifying cost-containment opportunities, and fostering strong end-user relationships to ensure business success. Manage and maintain 195 workstations and 4 servers in Carpinteria, CA, Alajuela, Costarica. Provide Remote assistance for 25 to 30 users located throughout North America. Deploy operating systems and software to client machines using microsoft sccm server. Setup and administer active directory accounts/permissions on windows server 2003 / 2008 / 2012. Provide remote assistance to staff via microsoft lync, remote desktop and remote assistance. Promptly and properly escalate unresolved issues, including complete problem descriptions, documentation of all actions performed, and all other pertinent details to the next level of support. Receive incoming support requests and inquiries, document and carefully analyze inquiries and trouble tickets. 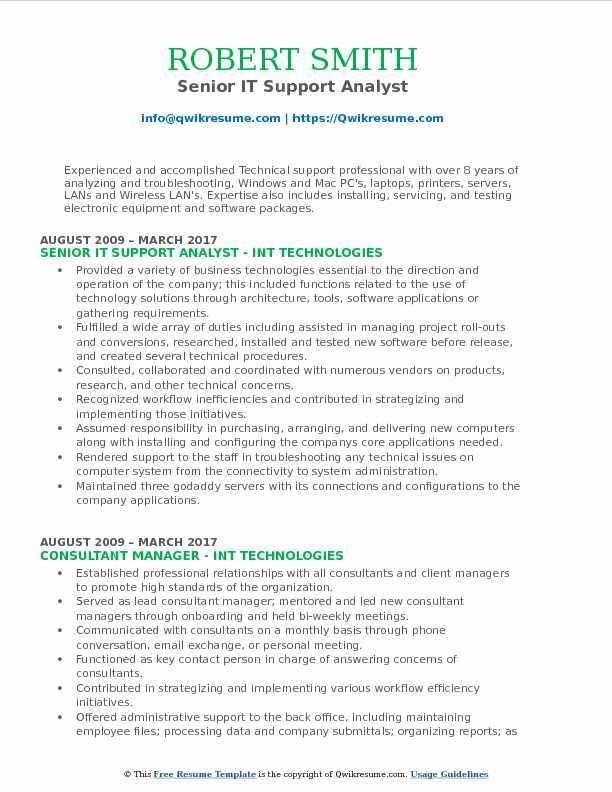 Objective : A skilled IT support professional with proven expertise in utilizing exceptional analytical and problem-solving capabilities. Seeking an IT support and systems administration opportunity. Processes requests for changes on behalf of IT supplychain, pricing, and finance analysts and business forecasters to resolve business and/or functional issues. Submits pricing requests in SAP for new tire lines, tire adjustments, retread, and tire deletions. Adds customer part numbers, material numbers and material extensions to customer information for proper purchasing and billing purposes. Assist with on-boarding new department members, cross-training, and providing update to onboarding systems to it. Serves as a backup to the sap security administrator by submitting sap security requests from global goodyear users. Responsible for training and drafting and creating documentation for current procedures. Interacts and collaborates with cross-functional teams to determine user's requirements. 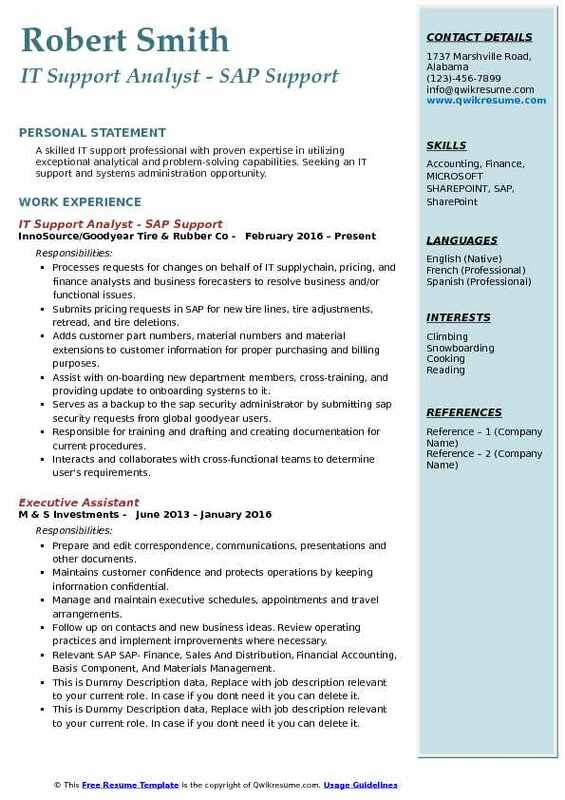 Summary : My objective is to obtain an IT management, analyst, or consulting position that contributes to the success of the organization via 18+ years experience in various global industries. Provide IT and Network Infrastructure support for an 850,000 sq. Ft. Manufacturing facility with 80 Cisco Switches, 30 fiber optic connected intermediate distribution frame cabinets, 50 Wireless Access points, 400 Desktops and Laptops, 75 HP Enterprise Printers, 30 Tablets, 300 VOIP phones, 15 a/v projection systems, and a main data center. Managed IT assets, performed deployment, configuration, and technical support for computers, printers, and Cisco voip phones. Including various models of dell desktops and laptops, several models of business class hp laser printers, multi-function printers, and plotters. Reduced production floor call volume by 50 percent by developing a call tracking and reporting method, determining the root cause of issues, and implementing corrective actions. Additional roles included active directory administration, cisco catalyst 2960 series switch installation and port testing, nas connectivity, cctv security camera connectivity and troubleshooting, rf hand held scanners, vpn and citrix connectivity, firewall issues, wireless networking, and pc imaging. Coordinated and oversaw data center ups and cooling system repair project in late 2016. Gained extensive experience as a key member of the team that performed a factory network domain transition in late 2016 and early 2017. Performed presentations on company systems, login requirements, and citrix farm accessibility for new hire orientation. Summary : Experienced and accomplished Technical support professional with over 8 years of analyzing and troubleshooting, Windows and Mac PC's, laptops, printers, servers, LANs and Wireless LAN's. Expertise also includes installing, servicing, and testing electronic equipment and software packages. Provided a variety of business technologies essential to the direction and operation of the company; this included functions related to the use of technology solutions through architecture, tools, software applications or gathering requirements. Fulfilled a wide array of duties including assisted in managing project roll-outs and conversions, researched, installed and tested new software before release, and created several technical procedures. Consulted, collaborated and coordinated with numerous vendors on products, research, and other technical concerns. Recognized workflow inefficiencies and contributed in strategizing and implementing those initiatives. 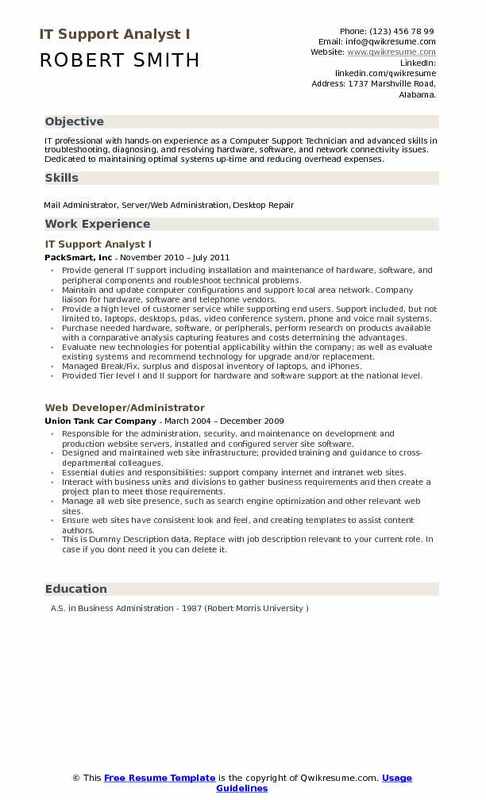 Assumed responsibility in purchasing, arranging, and delivering new computers along with installing and configuring the companys core applications needed. Rendered support to the staff in troubleshooting any technical issues on computer system from the connectivity to system administration. Maintained three godaddy servers with its connections and configurations to the company applications. 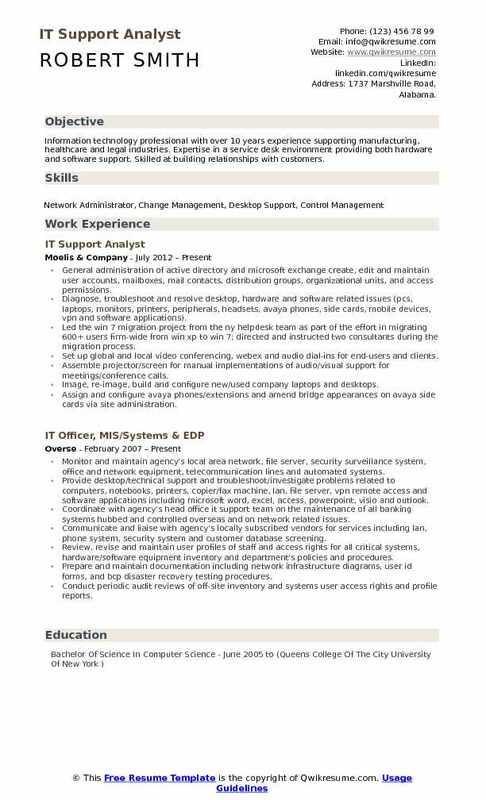 Objective : A self-motivated; hard working individual with proven skills in computer technology and networking . Able to work on own initiative and as part of a team. First-class analytical and problem solving skills in information technology; Dedicated to maintaining high quality standards. Provide desktop support to approximately 200 users remotely and onsite on managedesk ticketing. Install and configure user email accounts in lotus notes client and sametime and resolve various issues as they arise as well as offer training. Replace various pc and laptop hardware, such as hard drives, memory, network adapters, broadband air cards, power supply, laptop screens, fans, etc. Install and configure various model dell mfp, hp and datamax printers on company wireless and cabled networks. Setup new laptops and desktops with peripherals, required softwares, network drives, and printers. Create users, groups, objects, assign users rights, reset passwords and unlock accounts in active directory, as well as validate inventory and clean up ad. Install required software and devices on terminal servers and troubleshoot and resolve user access when access is lost. 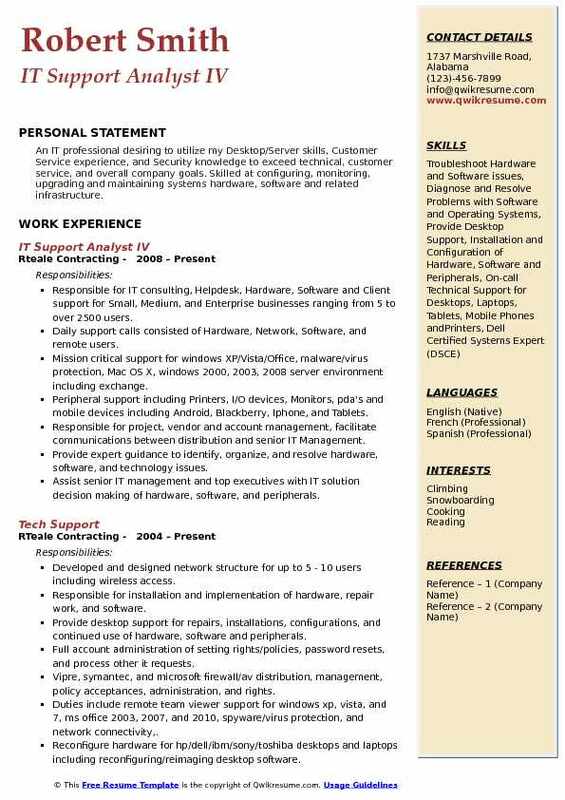 Summary : An IT professional desiring to utilize my Desktop/Server skills, Customer Service experience, and Security knowledge to exceed technical, customer service, and overall company goals. Skilled at configuring, monitoring, upgrading and maintaining systems hardware, software and related infrastructure. Responsible for IT consulting, Helpdesk, Hardware, Software and Client support for Small, Medium, and Enterprise businesses ranging from 5 to over 2500 users. Daily support calls consisted of Hardware, Network, Software, and remote users. Mission critical support for windows XP/Vista/Office, malware/virus protection, Mac OS X, windows 2000, 2003, 2008 server environment including exchange. Peripheral support including Printers, I/O devices, Monitors, pda's and mobile devices including Android, Blackberry, Iphone, and Tablets. Responsible for project, vendor and account management, facilitate communications between distribution and senior IT Management. Provide expert guidance to identify, organize, and resolve hardware, software, and technology issues. Assist senior IT management and top executives with IT solution decision making of hardware, software, and peripherals. Summary : Self-motivated and conscientious IT professional with outstanding communication skills, analytical abilities and great attention to detail, seeks a position that offers opportunities to learn and advance professionally. Provides in-person, remote desktop, and telephone support to over 700 end-users distributed across 33 worksites nationwide. Installs, configures and supports various software programs on desktops, laptops, tablets, network printer, scanners, and other hardware systems. Troubleshoots various hardware, login and connectivity issues, performs virus removal procedures, and pc performance analysis; rebuilds windows desktops to maximize performance as necessary. Services approximately 100+ customers daily, ensuring requests are processed well within company established deadlines. Directly supports senior managers and executive staffers; subsequently creates user accounts, ensuring appropriate user permissions are assigned in compliance with established security protocols. Escalates severe issues to other technical staff members within IT and third party vendors when required, based on established service level agreements (slas). Supports the network team with troubleshooting network outages in remote offices; installs and replaces network equipment (e. G. Network routers, switches), ensuring continuity of operations. 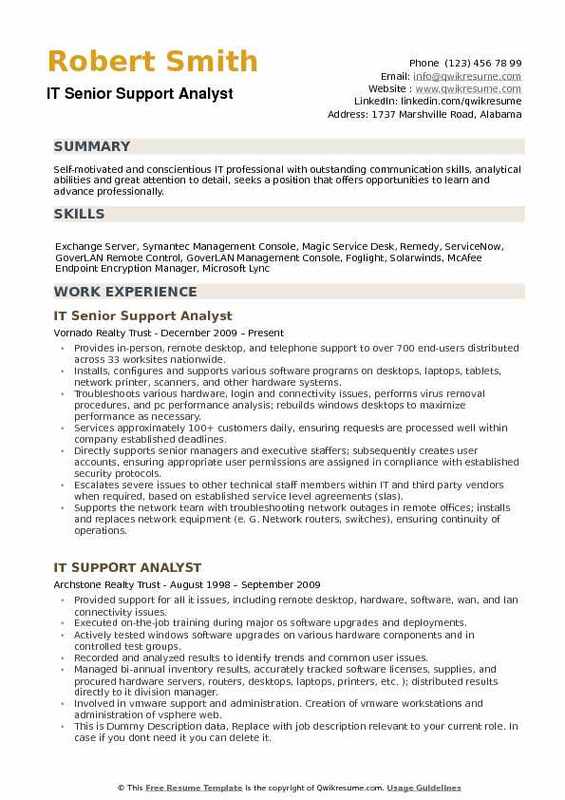 Summary : IT professional with hands-on experience as a Computer Support Technician and advanced skills in troubleshooting, diagnosing, and resolving hardware, software, and network connectivity issues. Dedicated to maintaining optimal systems up-time and reducing overhead expenses. Provide general IT support including installation and maintenance of hardware, software, and peripheral components and roubleshoot technical problems. Maintain and update computer configurations and support local area network. Company liaison for hardware, software and telephone vendors. Provide a high level of customer service while supporting end users. Support included, but not limited to, laptops, desktops, pdas, video conference system, phone and voice mail systems. Purchase needed hardware, software, or peripherals, perform research on products available with a comparative analysis capturing features and costs determining the advantages. Evaluate new technologies for potential applicability within the company; as well as evaluate existing systems and recommend technology for upgrade and/or replacement. Managed Break/Fix, surplus and disposal inventory of laptops, and iPhones. Provided Tier level I and II support for hardware and software support at the national level. 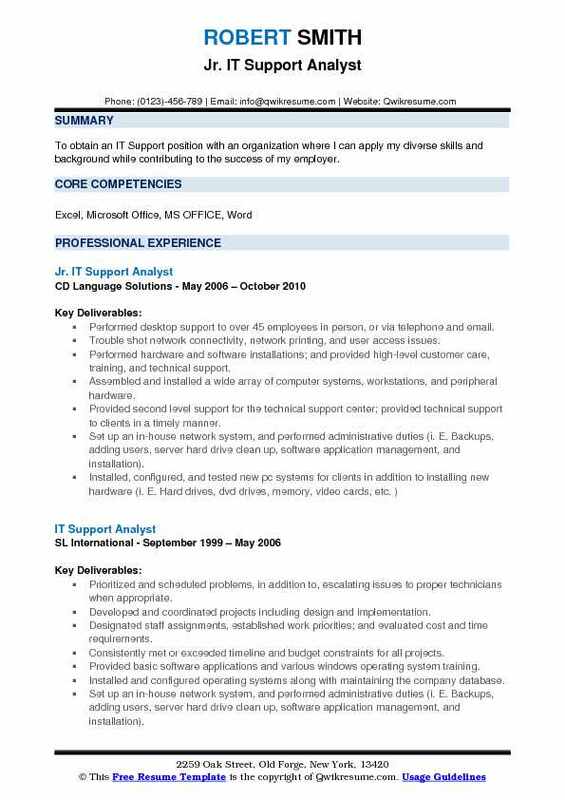 Summary : To obtain an IT Support position with an organization where I can apply my diverse skills and background while contributing to the success of my employer. Performed desktop support to over 45 employees in person, or via telephone and email. Trouble shot network connectivity, network printing, and user access issues. Performed hardware and software installations; and provided high-level customer care, training, and technical support. Provided second level support for the technical support center; provided technical support to clients in a timely manner. Set up an in-house network system, and performed administrative duties (i. E. Backups, adding users, server hard drive clean up, software application management, and installation).